Storyline: Siblings, Eric & his surreal artist sister Kay, her doctor husband David, her sister-in-law Brooke along with pilot Marsh become stranded on a rugged isle face off against a supernatural beast drawn to Kay who dreams of its killings. This modest but infamous B-movie effort from J.S. Cardone, representing also his first-ever produced screenplay, was filmed almost entirely on Tybee Island, a “popular vacation spot” located in Georgia, USA. Cardone’s story follows two vacationing couples’ whom move to a deserted island beach-house amidst the terrifying menace of a recurring nightmare – endured by Kay (Sarah Kendall, no relation to genre starlet Suzy) a troubled artist who also realizes some bizarrely familiar locations, which were formerly, and mysteriously, painted by her, whist visiting this spooky island. VIPCO’s tagline of: “Is it a dream, or is it... 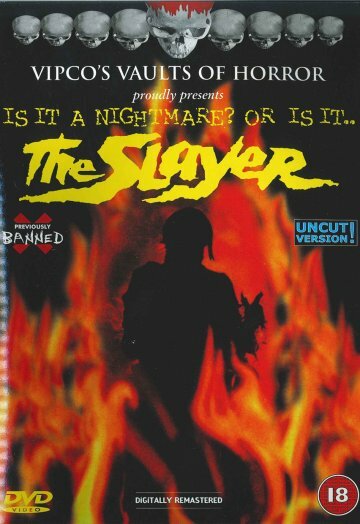 The Slayer” sums up this one perfectly, as the group are mercilessly stalked and violently murdered by a horrific and supernatural demon-like creature. This now collectable June 1982 VIPCO release – a version that wouldn’t re-emerge for almost 20 years – offered UK audiences that rare opportunity to watch the full version of Cardone’s film. I admit to having something of a soft spot for this oddly fascinating gem; a horror movie that surprised me in so many ways; one being it’s spooky location-fuelled atmosphere that genuinely helped enormously. Somewhere in-between all this BBFC indecision however, and during the height of VIPCO’s re-emergence as a video distributor, The Slayer reappeared on tape. This 1992 re-release was however shorn of some 14 seconds; precautionary cuts which were imposed upon a scene, to reduce the impact of a graphic pitchfork murder. This was undoubtedly to remove sight of dripping blood from the female victims’ inexplicitly shown breasts – a huge BBFC taboo at the time. Before VIPCO bowed out, closing their doors in 2007, The Slayer received a much welcomed digital release. Sadly the company was often criticised for its handling of these much cherished horrors of theirs – films which were often re-released in so-called “digitally Remastered” editions – whereupon Cardone’s film appeared in the same unkempt but happily uncensored 4:3-framed print that was likely used for its original 1982 release. In the US, The Slayer appeared on a double-billed release from Continental Home Video alongside Bruno Mattei’s Scalps. Reportedly this release of the film was purposefully shortened to 75 minutes, yet none of the gory highlights had been removed.